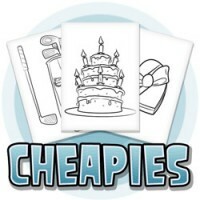 "Cheapies" bring you fantastic digis at pocket money prices. your basket or when you just want a little treat. "Gardening Gus" cheap digi stamp It's time to get to grips with the garden, there's a small tribe of..
"Grumpy Monkey" digi stamp. Even primates have that monday feeling some times.. ..
Night Nurse Nina Digital Stamp Where would we be with out a T.L.C when we're feeling a little under ..
"Sidney the Snake" digi stamp..